Hilltop San Casciano in Val di Pesa (or San Casciano VP as it's often known) is 17km south of Florence, is the largest and busiest town in Chianti. Long an outpost of Florence, it suffered numerous vicissitudes until its walls were begun by the ill-fated Duke of Athens in 1342. Within these, near the gateway, the church of Santa Maria del Prato (1335) has retained its trecento interior and trecento art: a fine pulpit by Giovanni Balducci da Pisa, a pupil of Andrea Pisano, a crucifix attributed to Simone Martini, a triptych by Ugolino di Neri, and framed paintings on the pilasters by Giotto’s pupil, Taddeo Gaddi. 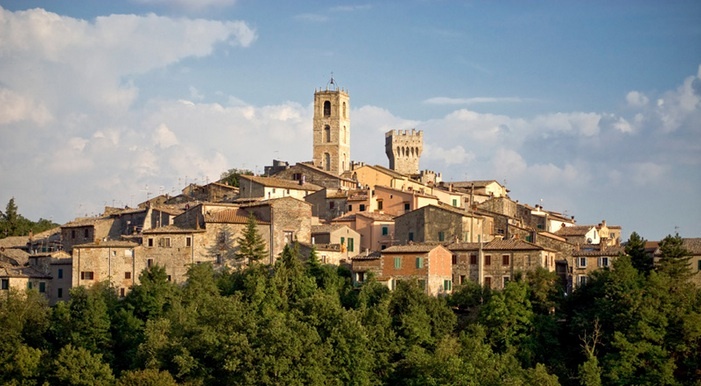 The Museo di San Casciano (see Practical Info for hours) has an archaeological and sacred art collection (including the Madonna and Child, considered to be the first work by Ambrogio Lorenzetti. Or make a pilgrimage to Sant'Andrea in Percussina, the home base of the Machiavelli clan. Florentine merchants and noblemen dotted the surrounding countryside with villas. Today they are produce Chianti Classico. Two of the most beautiful are the late Renaissance Fattoria Le Corti, 2km east on the Mercatale road, owned by the princely Corsini family for the past six centuries, and the 17th-century Poggio Torselli (now a hotel) just off the SS2, approached through a long avenue of cypresses and surrounded by a lovely garden. The villages around San Casciano Mercatale in Val Pesa, Bargino (home to the new avant garde Antinori winery and Barberino Val d’Elsa Mercatale grew up around its market, protected in the old days by the 14th-century castle of San Casciano a Decimo (so named for its ancient Roman milestone) built by the bishops of the bishops of Florence, now a ruin fit only to protect the odd lizard. Another hilltop villa along the Mercatale–Campoli–Montefiridolfi road is the Villa Palagio, now owned by Sting, although you can rent it. The Mercatale–Panzano road will bring you to La Torre a Luciana, an unspoiled medieval hamlet once belonging to the Pitti family.